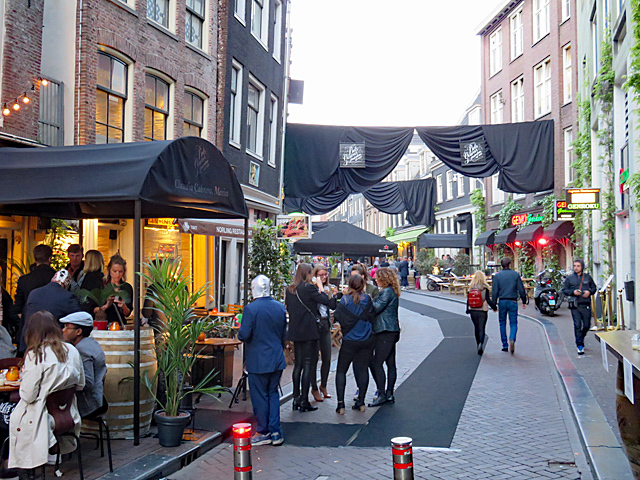 In addition to the big street parties, there are so-called Street Takeovers in Reguliersdwarsstraat. This means that the western part of the street, which in 2016 was renamed Secret Village, is "taken over" by an external event. This can be a large network meeting, a sports event or an international conference. There are special activities for the participants of these events and they can also discover the many bars and restaurants in the street at a discount. For participants of the World Architecture Festival (WAF) held at the RAI. Extensive evening program for participants of the Horecava fair, held at the RAI. For participants of the ReMaTec international fair of the remanufacturing industry, held at the RAI. Opening party of the annual conference of The Next Web (TNW), an international weblog for tech-startups. For participants of the international FinTech conference Money 20/20, held at the RAI. For the second time, the Bols Around The World (BATW) World Championship bartending is being held in Secret Village. 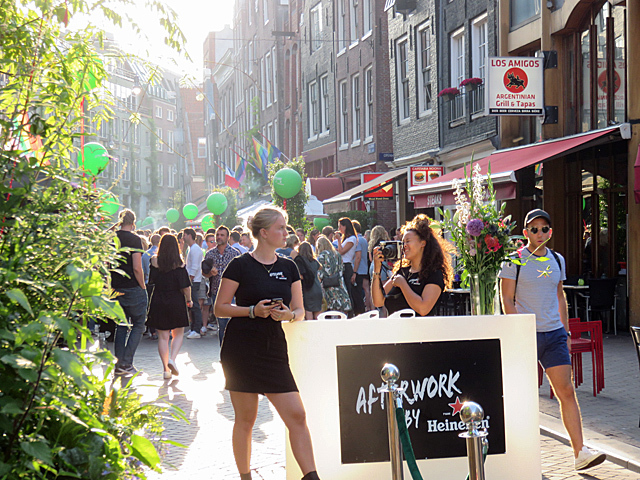 For the third time, the network event Heineken Afterwork will take place in Secret Village. Large network event for the media, entertainment & technology conference IBC 2019, held at the RAI. The idea for the Street Takeovers arose after the business association renamed the western part of Reguliersdwarsstraat into Secret Village in the summer of 2016 - not only to attract more individual visitors, but also larger groups. With the variety of bars and restaurants, the pedestrian zone and the richly planted green vegetation, the central part of the street is a unique ambience for larger gatherings. That is nothing new, because during the Sunday Happy Hours at the former April (and nowadays at Taboo) the street was already full of people. The first Street Takeover was on May 10, 2017, when the Bols Around The World (BATW) World Championship bartending took place in Secret Village. For that occasion, the street was completely decorated in style and renamed Bols Geneverstreet. The second occasion was a month later, when the large network meeting Heineken Afterwork took place for the first time in the Reguliersdwarsstraat. In the meantime, the business association had entered into a partnership with the RAI Amsterdam convention center, so that Street Takeovers could now complement international conferences. This allows congress participants to get acquainted with a wide variety of bars and restaurants in an easy and inexpensive way. The first Street Takeover in collaboration with the RAI was on June 5, 2018 for the FinTech conference Money 20/20. Immediately after, gay rugby players took over the street when Secret Village acted as Home of the Bingham Cup. 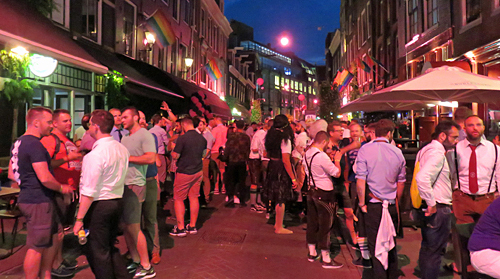 However, a collaboration with the international conference AIDS 2018 ended at the last minute, but Heineken Afterwork was back on July 19. The Street Takeovers attract between 1,500 and 2,500 visitors and they not only provide the participating businesses but also the business association with additional income as well as with broader brand awareness. There were also Street Takeovers to attract extra public in the quiet winter months: like on November 28, 2018 for the World Architecture Festival and from January 7-9, 2019 as the evening program of the Horecava. However, both attracted few people, probably due to a combination of unpleasant cold weather and the fact that they were being held for the first time.